Given the economic clout of South Korea I’m somewhat surprised that Korean restaurants aren’t more common and popular in London. Although there are an increasing number of them in places such as around Centre Point or in New Malden, most are scrappy, slightly run down eateries that aren’t going to attract newbies unfamiliar with Korean food. A new Korean restaurant on High Holborn could change that. The unoriginally named Kimchee is large and looks very slick. 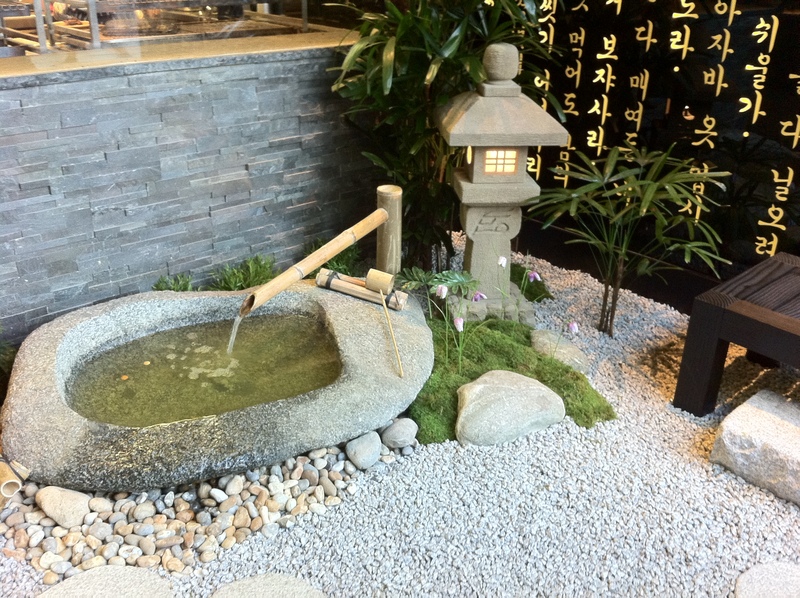 The waiting area has a miniature rock garden and fountain as well as a wall inscribed with Korean characters while the semi-communal tables are designed for groups of six or less. The atmosphere is quite buzzy and loud due to the large number of chattering diners, so Kimchee is more a place for sharing food with friends than a place for having a quiet romantic or business meal. My garden looks like this. 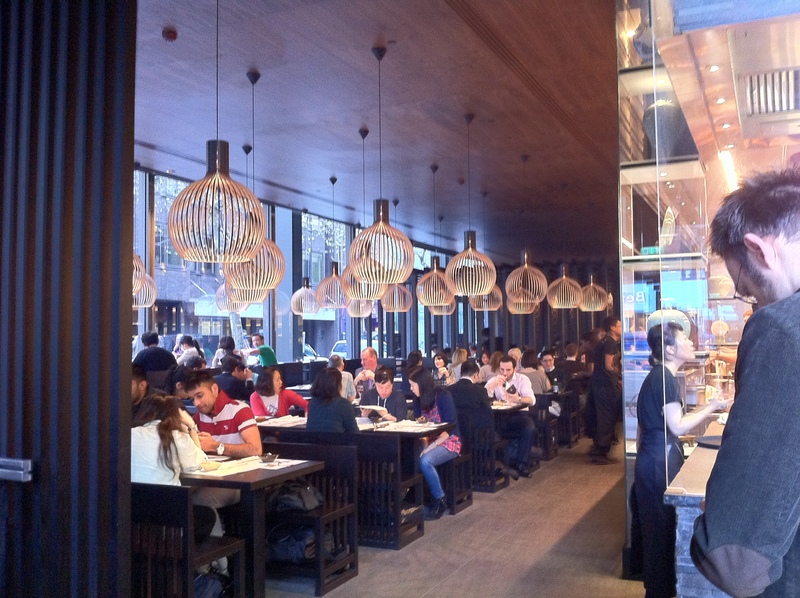 For some reason a wooden cage splits the dining area into two – I imagine one is set aside for diners with reservations while the rest are for walk-ins. Lone diners will appreciate the bar-like bench that runs around the edge of the room, although the heavy wooden stools are rather uncomfortable. The sleek appearance belies the low prices so if I didn’t know better, I’d swear this was an Alan Yau operation. 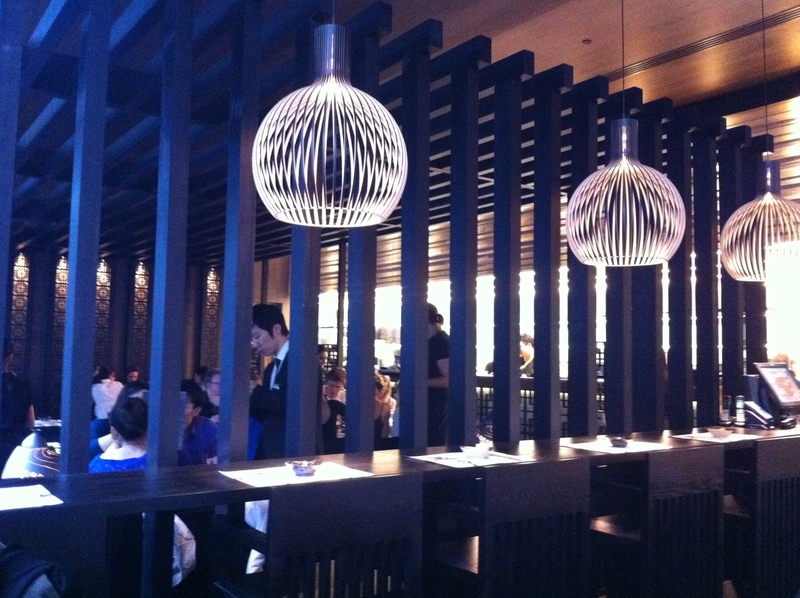 The food is traditionally Korean with almost no contemporary twists that I could discern. Perhaps one of the most important dishes is the Korean staple kimchee – spicy fermented cabbage that doesn’t appeal to everyone but I love it. The kimchee here isn’t as immediately, overpoweringly spicy as other examples of the dish that I have had, but has a cumulative spiciness that sneaks up on you. In a way, the lack of a piquant punch is a good thing, as I found the sour tartness of the preserved vegetables surprisingly refreshing on the unseasonably warm April evening of my visit. As you might be able to tell from previous entries on this blog I’m a big fan of raw meat and fish so I had to try Kimchee’s version of dolsot bibimbap with raw beef. 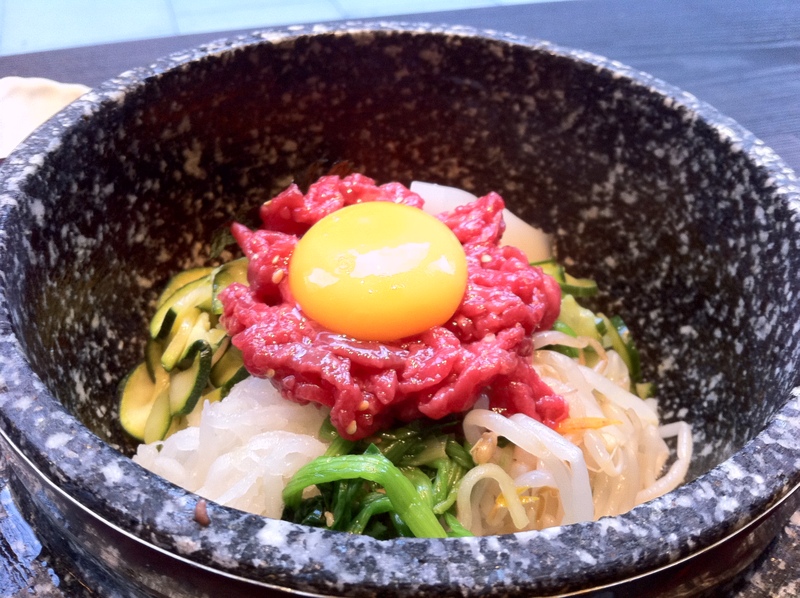 Dolsot bibimbap is essentially a hotpot where a scorching hot bowl filled with rice, seasoned vegetables, a raw egg and another topping of your choice. I opted for raw beef, but there are plenty of other choices for the squeamish among you. The idea is that you mix all the ingredients together and the hot bowl warms them all up together. It sounds like a rather simple and uninspired dish, but it really is greater than the sum of its parts. Although the rather bland raw beef won’t set carnivores’ tails wagging, it’s suitably moreish when slathered with the tangy and pert sauce although, like the kimchee, the sauce isn’t quite as spicy as I would like. Combined with the nutty sesame oil flavoured rice and surprisingly citrusy, zesty flavoured vegetables, it all comes together very nicely. The portion was a touch on the small side though. Korean food is famed for its grilled and barbecued meats so I couldn’t pass up the chance to sample skewers of grilled scallops and beef tongue. 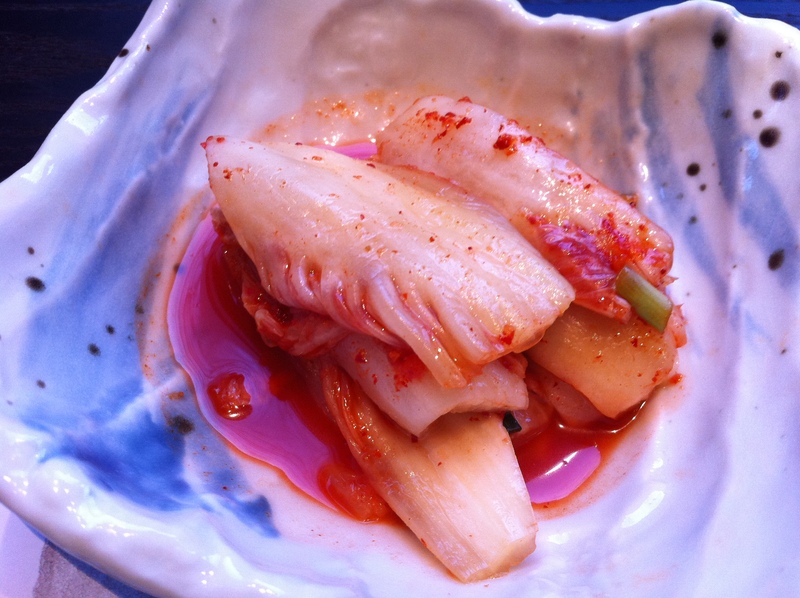 I prefer my scallops firm with a nice salty tang, so Kimchee’s softer scallops aren’t exactly to my liking, but they’re still pleasing thanks to their slightly sweet flavour. I’ve never had beef tongue before, but in any case Kimchee’s version was almost entirely dependent on its smoky chargrilled exterior and dusting of chilli powder for its flavour. Nonetheless its succulent juiciness combined with its soft, melting texture and slightly springy bite make it a distinct pleasure. Texture can be just as important as flavour and sometimes, like here, it can make up for flavour that would underwhelming on its own. Scallops to the left, beef tongue to the right, here I am, stuck in the middle with you. At this point I really should’ve stopped eating, but I couldn’t resist dessert. 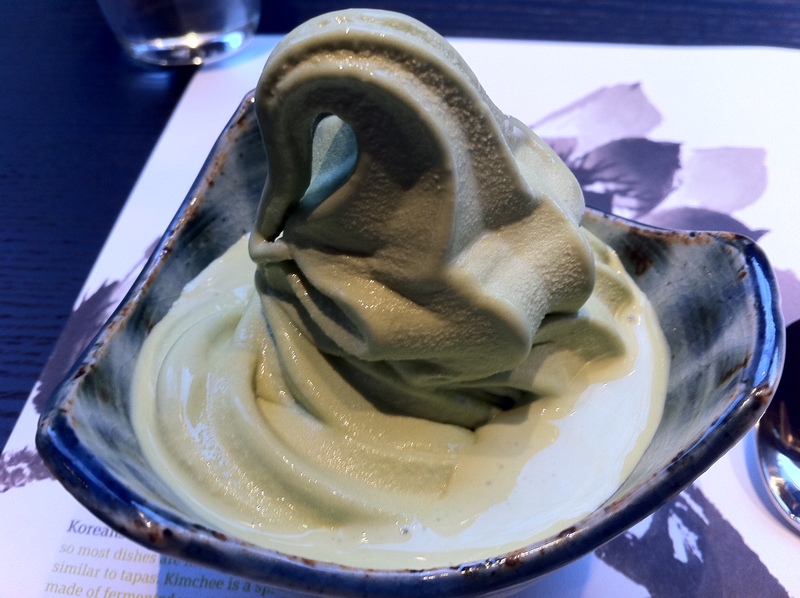 Green tea ice cream is an increasingly common dessert, found in Korean, Japanese and Western restaurants but is often deeply disappointing with a flavour that’s too subtle for its own good. That wasn’t a problem here – the soft ice cream had a surprisingly rich, deep taste that’s instantly evocative of green tea. I’m more of a coffee than a tea person so I don’t know which of the numerous green teas available most closely matches Kimchee’s green tea ice cream, but it’s a very addictive dessert. This isn’t your father’s green tea ice cream, oh no. In a first even for me and my gluttinous ways, I ordered a second dessert. I’m not usually a fan of the bean and rice based desserts commonly found in Asia, but the chapssalddeok was a pleasant surprise. These small cakes made from rice and bean flour are gooey and a little bit chewy which made them fun to eat. The rather simple chocolate taste and dusting of cocoa powder on top won’t impress hardened chocophiles used to complex, layered chocolate desserts but that’s not really the point here. 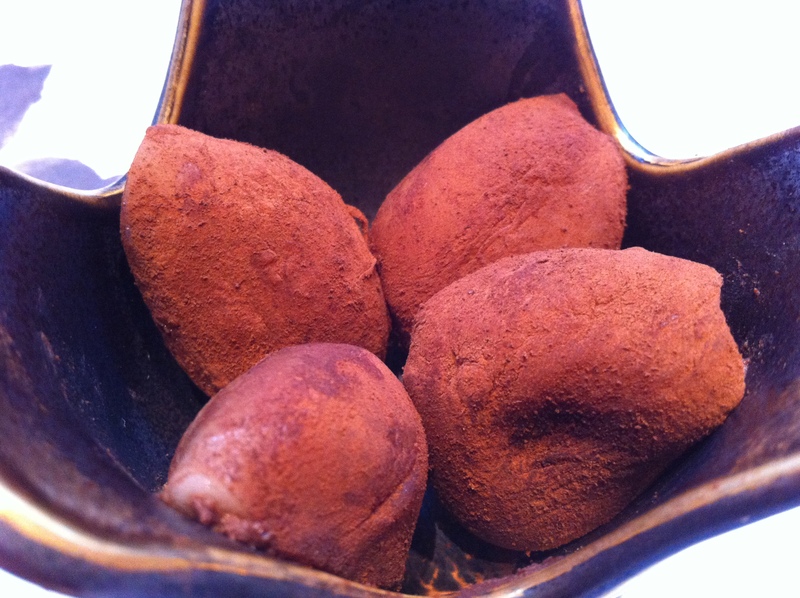 Although the Euro Hedgie, a notorious dessert snob, would almost certainly turn up his nose at Kimchee’s desserts, I found enjoyed them as the uncomplicated little dollops of refreshing sweetness that they were. I washed it all down with iced plum tea. 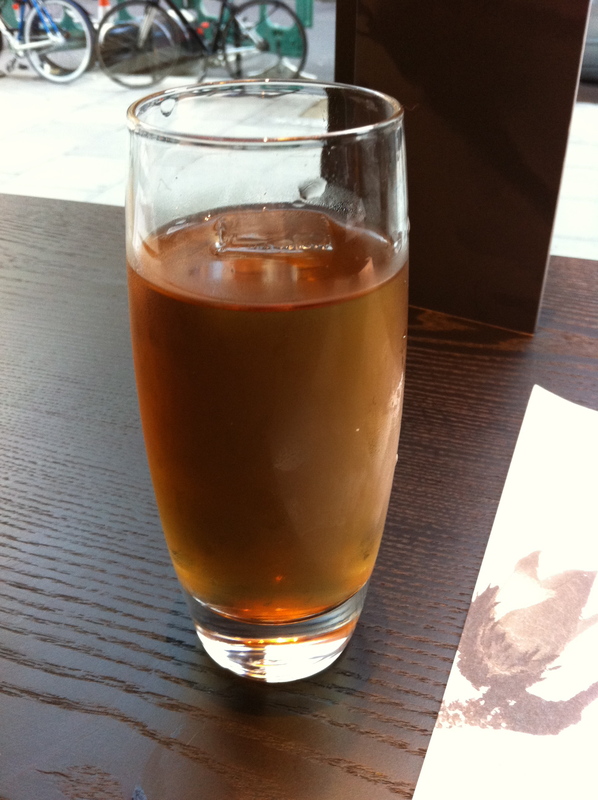 Although refreshing, the rather artificial plum taste was reminiscent of a Robinson’s squash drink. Not bad, but at £2.60 it’s overpriced like most restaurant drinks are. I dined at Kimchee on the day after it opened with a 50% discount in effect for its opening period (6th-18th April) while the kinks were worked out and there certainly were plenty of kinks. Dishes weren’t cleared away promptly, my second dessert arrived long after my first and it took almost 15 minutes to settle my bill. I couldn’t fault the friendliness of the staff though (one especially charming member deserves a special mention, but you know who you are). Although the cooking isn’t perfect, Kimchee nonetheless an enjoyable experience with some well-prepared, tasty dishes that don’t cost the earth. Hopefully the service kinks will be resolved and the kitchen doesn’t lose its touch because I’ll be back. Four stars. Opening Hours: seven days a week 11.00-23.00. Reservations: probably a good idea. Total cost for one person including soft drink: £24 approx (I actually only paid £13 as part of Kimchee’s 50% off opening period offer, but £24 is what my meal will cost at regular prices. In any case you’ll pay less unless you’re a glutton like me). 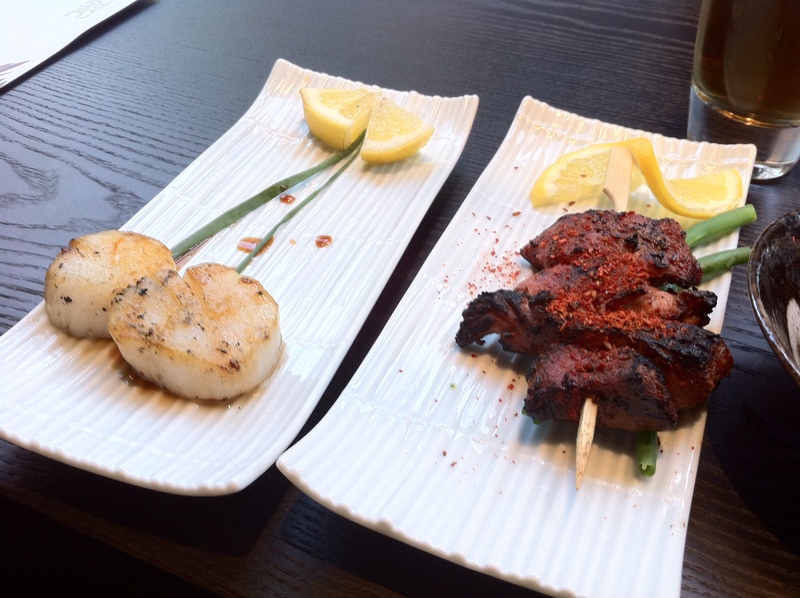 Tags: bbq, bibimbap, chapssalddeok, green tea, grilled, high holborn, ice cream, kimchee, london, restaurant, review. Bookmark the permalink.